The way Dell introduced the Inspiron Mini 9 was pretty inspired, so it's almost been depressing watching the steady stream of leaks deflate it into a now familiar device, even though it's only being released today. As leaked, inside is an Intel Atom Diamondville processor and it has a 1024x600 LED-backlit screen with 4, 8 and 16GB SSD options (plus you get 2GB free online storage at Box.Net) and about three hours of battery life. Only the Windows XP version is available now for $399, in black or white-the $349 Ubuntu flavor, along with the rest of the six-color rainbow are a few weeks away. Update: You can pick one up for $99 if you buy another Dell AND it has 3G hidden inside. ·Box.net Web Storage Keeps Your Personal Files Safe And Enables Anytime Access and SharingROUND ROCK, Texas, Sept. 4, 2008 –Dell today officially unveiled the Inspiron Mini 9. This small, easy-to-carry device stands ready to connect teens, tweens, travelers and "Tweeters" to their online world be it surfing the Web, chatting with friends, blogging, streaming content, uploading photos or enjoying favorite online videos, music and games. The Inspiron Mini is an affordable Internet companion that can be fine-tuned to fit users' specific needs and deeds. 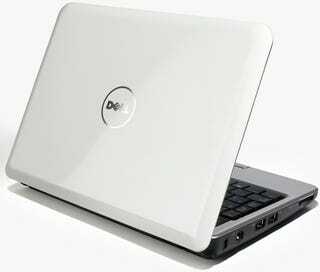 It is available now on www.dell.com/mini in the U.S., Japan and select countries in Europe. Availability elsewhere will be handled on a country -by-country basis. · Built-in Webcam, bundled with Dell Video Chat, making it easy to stay in touch using video chat, recording and sending video emails, or even PC-to-PC phone calls around the world. DVC even supports four-way calling, making virtual family reunions a reality. · Built-in Bluetooth® for easy wireless connections to Bluetooth-enabled accessories like a pair of stereo headphones, a mouse, a printer, etc. Dell has teamed up with Box.net to offer exclusive web-based file storage, access and sharing to Inspiron Mini users, including a free Basic plan with 2GB of remote storage space, expandable to 25GB. Dell's Inspiron Mini will include a direct link to a Dell-exclusive home page on Box.net (www.box.net/dell), providing users with an easy way to add incremental online storage space to easily manage their digital lives. Individuals can safely and securely upload files of any type to their Box, including photos, videos, music, documents and presentations, and then access those files from almost anywhere on any device. Box.net's world-class service requires no software to download. With its OpenBox platform, Box.net enables people to edit documents and photos directly from their web-browser and post media to their blog or social networks, further enhancing the mobility and user experience on the Inspiron Mini. Individuals can personalize their Inspiron Mini with choice of colors – Obsidian Black or Alpine White – and interaction experience – optional Windows® XP® or Ubuntu 8.04 with custom Dell interface (coming soon). For those looking for a more traditional and familiar experience, the Inspiron Mini with Windows XP Home is available immediately starting at $399. Inspiron Mini devices featuring an intuitive Dell-developed custom interface are expected to be available in a few weeks with a starting price of $349. The custom home screen is designed to make it easy to find what people are looking for. Intuitive icons link directly to groups of similar applications, like games, Web and entertainment, and favorite web links for quick access. Plus, the home screen can be personalized, putting your favorites front and center. This highly mobile and fun device can be carried anywhere in style thanks to a full line of custom "Designed for Dell" backpacks, messenger bags and convertible cases from merchants including Timbuk2. Blending high fashion and superior function, the coordinated bags and accessories incorporate subtle design elements and offer Inspiron Mini owners a unique way to express a personalized, integrated style. "Designed for Dell" products currently are available in the United States, Canada and Europe. · Dell Support Center: Quickly access Dell service and support from an icon on your desktop that provides automated fixes, software upgrades and tools to help keep your system up-to-date and running efficiently. · DellConnect™ Remote Assistance:[ii] Dell experts help diagnose and solve PC problems via an Internet connection (available only on Windows-based systems)."